Imagine being able to enjoy all the benefits of genuine hardwood shutters within the same budget as lower grade MDF products. Sounds too good to be true - YES! Fact is: Our Hybrawood Specialist Shutter range offers the most affordable choice for everyone looking for quality solid hardwood that's perfect for coping with the wear and tear of everyday living and the growing demand for exquisite style. 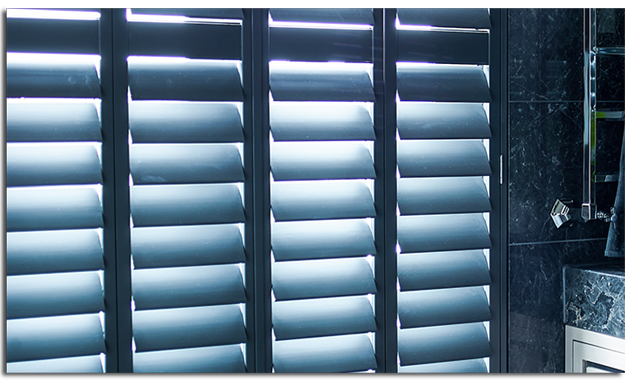 Each Hybrawood shutter is individually constructed from solid hardwood, with an ultra-durable aluminium core running through each slat on panels wider that 400mm. This offers amazing protection against damage and a significantly longer lifespan compared to similar priced products designed with the price conscious customer in mind. Rest assured, Hybrawood Shutters are built to last, look fantastic - even after years of wear and will never go out of fashion. All frames, stiles and rails of Hybrawood Shutters are craftsmen made from Forest Stewardship Council accredited timber and provide a high degree of flexibility during installation. Unlike PVC and MDF frames that are harder to customise on the spot - Hybrawood Shutters can easily withstand minor frame adjustments and are especially suited to older houses where the windows may be wonky. When it comes to finishes the Hybrawood Shutter range offers a wide selection of colours to suit every taste and d�cor. Plus, your family and friends will never guess that the sleek finish hides a 100% hardwood shutter. Manufactured to exacting standards, every inch is covered in high grade UV protective paint to guarantee lasting beauty throughout your home. Finally, if our standard range of colours doesn't match your needs, Hybrawood Shutters can be custom colour matched to any Farrow & Ball, Dulux Trade or RAL colour. The choice literally is - endless!